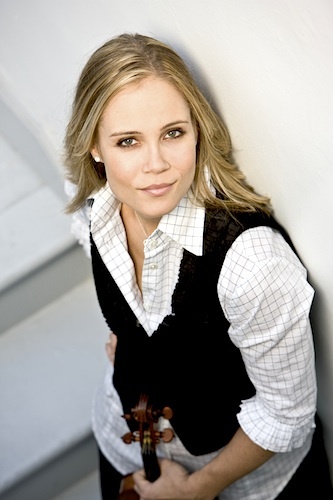 October 22, 2013, 2:38 PM · A quick look at Leila Josefowicz' concert schedule shows that her winter and spring is packed with performances of Esa-Pekka Salonen's Violin Concerto, Out of Nowhere, which was written for her, as well performances of the Stravinsky Violin Concerto in D.
Last year I spoke at length with both Salonen and Josefowicz about their collaboration -- now I find that they are about to do it again with the very same team and venue as the premiere -- this weekend in Disney Hall, with the Los Angeles Philharmonic! I checked in again with Leila to see how she's feeling about the piece, having lived with it now for some four years. She'll also be playing the piece this season with the New York Philharmonic (its NY debut), Toronto Symphony Orchestra, BBC Symphony Orchestra (UK premiere) and Orchestra Filarmonica della Scala. "It's really grown to feel part of me, and become very natural," Leila said, "Very wonderful feeling, since it was tailored made to my way of playing - now it's really in me. Some things will always be very difficult for me and any player out there, but that's part if the charm and challenge of the piece; it's meant to bring you to the edge." How are the audiences responding? "People are very blown away by the different moods of the piece, the rock ending of the third movement and then the very mysterious and somewhat undefinable feeling in the slow and grand last movement," she said. And how about being back in Disney Hall, where the piece first came to life? "I associate most of my new premieres with Disney since so many great ones have happened there, such as the Esa-Pekka Salonen and the west coast premiere of Steven Mackey's 'Beautiful Passing,'" Leila said. 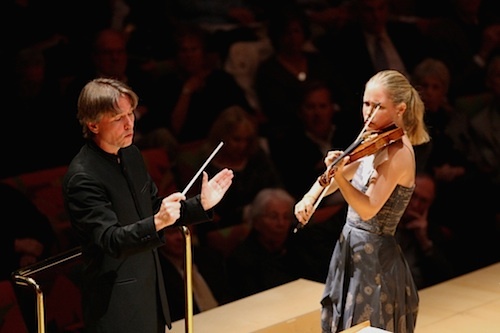 "But Esa-Pekka Salonen's is the performance -- before his departure -- in my heart, really." Another piece that Leila will play frequently this year is the Stravinsky Concerto, which she'll play with the Baltimore Symphony Orchestra, New World Symphony and National Arts Centre Orchestra of Ottawa. "I get great joy out of the Stravinsky because of the great character that, in my opinion, is written into the score," Leila said. "I started playing it in the last four years, which is relatively late, but seems now to have perfectly settled into my mind, body and repertoire. There are so many interactive elements to it, one is always playing in conjunction with another member of the orchestra in a sort of duo or trio or more. So to be listening and very aware and sensitive to the surroundings and acoustic is essential- while doing very difficult things on the violin!"